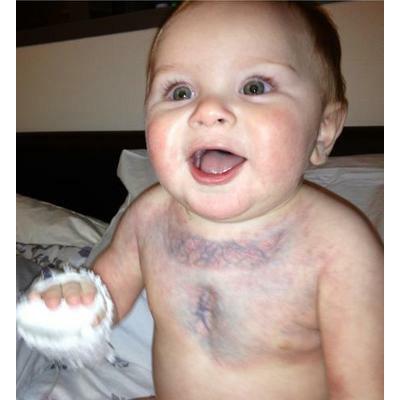 Casen Buswell was born with an extremely rare congenital vascular malformation called GVM Plaque Type. He is one of only 14 people in the world suffering from this condition – of which there are only two that present the same double hit deletion of the Glomulin Gene. Casen’s is very rare as it covers his thoracic area, belly, arms, upper shoulders/back, and right thumb. It is unfortunately very extensive and very dangerous. The treatment he needs includes multiple surgeries and constant care – most of which will require travel and possible relocation to Belgium so that he can be seen the one and only doctor capable of treating his condition. On top of all of that, insurance doesn’t cover Casen’s treatment because of its classification as “experimental”. This is why we need your help. Casen’s situation is so rare that even organizations like St. Jude Hospital and other non-profits are unable to lend a hand. Because of this, the Buswell family is in dire need of help. ANY help. And we have a great way that the community can lend a hand and benefit the family directly by taking part in a special event. In an effort to raise money for Casen’s continued care, we have scheduled a 5K race to take place on June 15, 2013 in Edgewood, WA. The Race for Casen is being organized to benefit the family and 100% of the proceeds will go directly to the Buswell family. But we need help from donors, sponsors, and community organizations to make this a success.